One of the main reasons this site exists is to showcase art that most people have never seen/heard. And in doing so, we hope that others will find something wonderful that may have never been discovered otherwise. Every once in a while I'll get asked how I find these hidden treasures. The truth is that there are a variety of ways. Sometimes it's a friend's recommendation. Sometimes it's by accident. And sometimes it's completely intentional. "Other Space" was mostly intentional. I've been a fan of Paul Feig ever since I watched "Freaks and Geeks" way back when. Although Judd Apatow (40-Year-Old Virgin, Knocked Up) got most of the credit for the show, it was Feig who originally created it, and his fingerprints are definitely what make the series work. Being a huge "Freaks and Geeks" fan, I tried to keep tabs on what Feig was working on. His more famous film projects include Ghostbusters (2016), Spy (2015), The Heat (2013), and Bridesmaids (2011). Feig has also directed episodes of popular television series such as "The Office," "Arrested Development," "Nurse Jackie," "Parks and Recreation," "Weeds," and "30 Rock," some of which he also worked on as executive producer. But for some reason, "Other Space" came in under the radar. Perhaps it's because of the whole Yahoo Screen debacle (more on that later), but this show deserves some recognition. And like most of Feig's projects, it's not just because of his involvement; his casting is (once again) spot-on. "Past the moon. Past Mars. Let us sail to the stars!" Released in April 2015, "Other Space" is set in...well...space, in the year 2105. But due to an encounter with a strange portal, the crew is transported to another universe -- or to an Other Space. It's been described as "The Office" in space, or even "The Office" meets "Lost in Space." 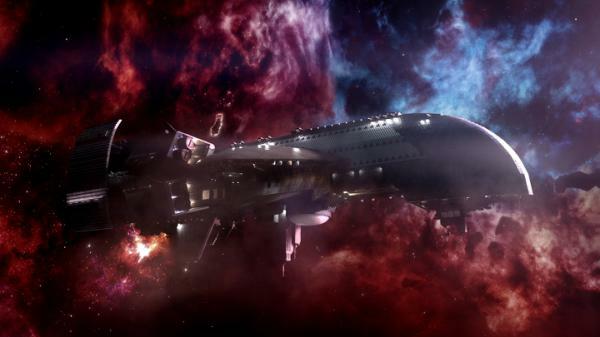 It's also been compared to the much-loved British series "Red Dwarf." The crew, within the UMP Cruiser, is a mixed bag of nuts. And though some of their characteristics can be traced back to stereotypical sci-fi shows, the cast of "Other Space" bring their own charm and talent. I honestly couldn't picture anyone else except these actors as their characters, especially given how easy these actors made it to love these oddballs. And I'm elated that they're mostly unknown actors. I've written about the lack of attention to lesser-known actors before, specifically in my article about the series "Detectorists," and "Other Space" is another prime example of untapped talent finally being explored. 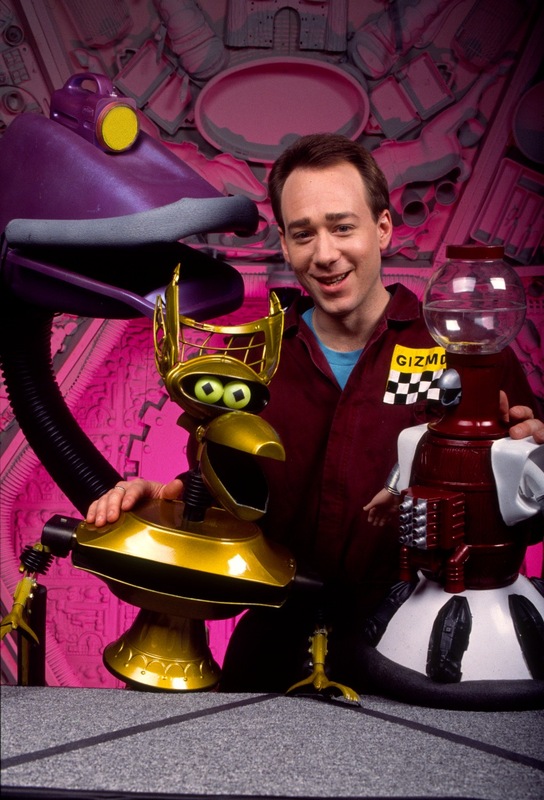 In fact, the most famous of the bunch are Joel Hodgson and Trace Beaulieu, both of whom achieved fame for their series "Mystery Science Theater 3000" (MST3K). And even that isn't all that famous outside of the cult fans (myself included). I'll even admit that my original reason for wanting to watch "Other Space" was because of Hodgson and Beaulieu. When I discovered Feig's involvement I thought, "Yup. This has a lot of potential to be great comedy." Hodgson, who created "MST3K," and Beaulieu, who voiced (as well as worked as puppeteer for) the character of Crow T. Robot, bring some comedy weight to the show. Both are in perfect form as their characters Zalian (played by Hodgson) the crew's engineer, and A.R.T. (played by Beaulieu), Zalian's robotic sidekick. What's surprising is that it's hard to tell if the rest of the cast is keeping up with Hodgson and Beaulieu or if it's the other way around. And we probably can thank Allison Jones for that. If their names don't look familiar, their faces might. All of these young actors have been working for years, bringing their talent to TV and film in mostly smaller roles. But this will hopefully change in the near future because they each have unique comedic skills that more shows and movies could (and should) all be taking advantage of. The Captain (played by Karan Soni), for example, might look familiar if you've seen Ryan Reynold's 2016 Deadpool film. Soni played the cab driver named Dopinder. I was so happy to see Soni in the film because, by that point, I had already seen him in "Other Space." All his scenes in Deadpool got some of the biggest laughs and I'm sure director Tim Miller and actor Reynolds were well aware. I wouldn't be surprised if Dopinder's character had been expanded for the film just because of Soni. On a side note, there's a rumor that Dopinder will be brought back for the Deadpool sequel, and the fans couldn't be happier. But Soni isn't the only one. 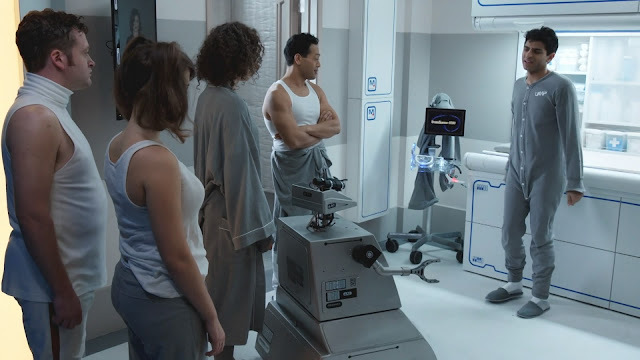 Tina (played by Milana Vayntrub) might look familiar too. 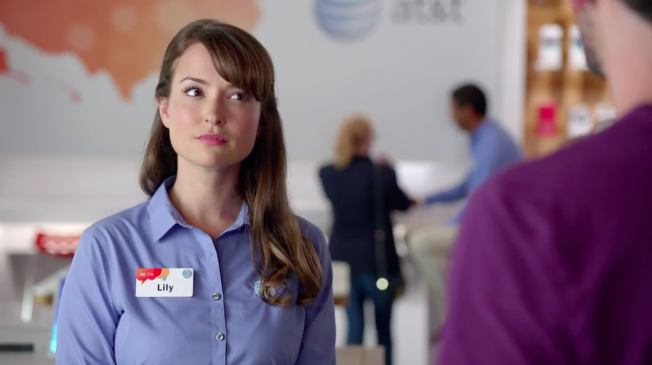 She's Lily, the really cute and friendly AT&T girl. Despite having over 40 projects under her belt (some of which I've seen), I've never noticed Vayntrub. And it's probably because she wasn't given anything with as much meat as she deserves. Now that I've seen her true talent being utilized on "Other Space" I'm a fan, and I'm looking forward to seeing her in future performances. 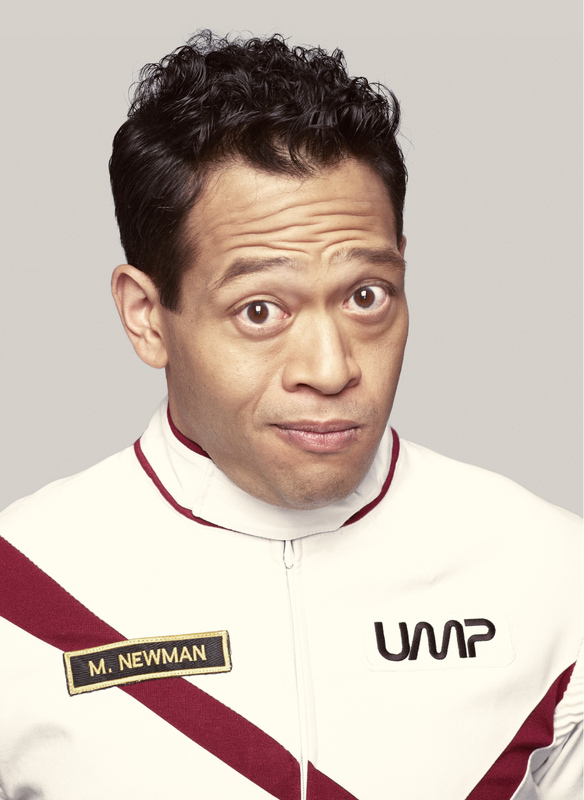 Eugene Cordero (who plays Michael) has appeared in over 75 projects since 1999, including "Arrested Development," "House of Lies," "Parks and Recreation," and "The Good Place." Most of these parts are extremely small, which is probably why you can't quite remember if you've seen him or not. 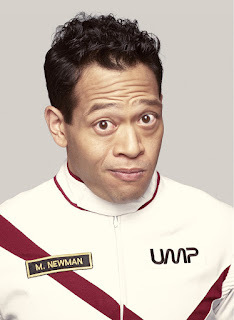 But of the entire "Other Space" cast, I'd keep a closer eye on Cordero because one day someone's going to realize his talent and make him huge. It's good to see that "Other Space" has created a bigger role for him. And though there's a running joke in the series that his character Michael is terribly forgettable, Cordero still makes him endearing. Whether Michael is getting yelled at or if he suddenly turns vengeful, Cordero transforms into whatever personality he needs at the moment -- often times flipping back and forth between them within seconds. The character Kent (played straight-faced by Neil Casey) comes across as a combination of Spock and Data (both, of course, from the Star Trek universe). Kent shares the emotionless of a Vulcan and the intelligence of an android. Casey's take, however, plays with inappropriateness. He displays a lack of sensitivity by providing valid yet ill-timed information. Throughout the season Kent transforms into a (slightly) more human version but Casey doesn't lose all of his character's awkwardness. One of my favorite Kent moments involves him waking up and regurgitating a mucus-like substance. I won't say more because it's more of a visual and sound-based gag, but it was completely unexpected, especially since his character is typically the most composed of the crew. Of course I can't leave out Conor Leslie and Bess Rous, who play Natasha and Karen Lipinski, respectively. Natasha is the ship's computer, but don't let the good looks fool you. She's just as out of place as the rest of the crew. There's an interesting development with her and another character throughout the season, but it's more than that. Her attempts to interact with each of the crew members are usually awkward, and, of course, fun to watch. Karen, the crew's first officer, just happens to be the captain's older sister. As it turns out, UMP put her there simply because they're all terrified of her. That should tell you a lot about Karen. Every sci-fi crew has to have one of those strict, by-the-book characters. But Rous takes that stereotype into new territory. Instead of playing Karen as the average "B" word, Rous plays her more of an insecure and jealous sibling. Fortunately, the writers do a great job avoiding stereotypical sitcom storylines and characters. There is eventually a moment in each of the episodes when you can tell that the writers are just having fun or playing around with sci-fi standards and clichés. Staff writer Shelby Fero leads the series' writing crew of Matteo Borghese, Owen Ellickson, Ben Smith, Rob Turbovsky, Jacob Young, and of course Paul Feig, who wrote the pilot. It's tough to find a favorite episode but I'd have to go with the sixth entry, entitled "Trouble's Brewing." The scenes with Tina and Michael are so full of comedy gold that I didn't want it to end. It's once again proof that the writers on the show wanted to create something unique by playing off of stereotypes. They may use old sitcom tricks as a platform, but where they jump to is something no one can predict. So with this writing crew, this cast, and a creator like Feig, why aren't more people aware of "Other Space?" I think the biggest reason is due to the fact that Yahoo's streaming app (Yahoo Screen) didn't take off. Unfortunately, by the time "Other Space" was released, Yahoo Screen was already dying. Not long after its release, the app was removed from the digital world, and all of Yahoo's shows were then "archived" on their site somewhere (note: At the bottom of this article, I provided a link to "Other Space" in Yahoo's archival location). What's worse is that it leaves Feig's labor of love in the vast vacuum of space. Now that Yahoo won't be creating original content, "Other Space" needs a new home. My gut reaction is to hate Yahoo, which isn't hard since their email service continually gets worse. But interviews with Feig have me second-guessing. Apparently Yahoo gave Feig all the creative space he needed while producing the show. Furthermore, Yahoo went above and beyond when the production went over budget (due to the special effects). I still don't like Yahoo Mail but I've got to give it up for Yahoo's support for Feig and the show. Feig is currently looking for someone to broadcast the show, as well as continue the series. Fortunately for Feig, the entire cast is eager to get back out into space. Feig has been proactively interviewing around cyberspace to explain his dilemma. The biggest struggle has been a lack of viewers. Those of us who couldn't wait for the show's release back in 2015 became instant fans. Upon hearing the news that he wants to get a season 2 made, fans around the world are starting to spread the word. Heck, I even bypassed a different article for this month (about Chris Isaak) just to help Feig get the word out sooner! The show needs a bigger audience and the best way to do that is to share this show with your friends and family. That's what I'm trying to do -- just like other recent articles and interviews about "Other Space" are doing. And you can help too! If you like the show, use your social networking abilities. 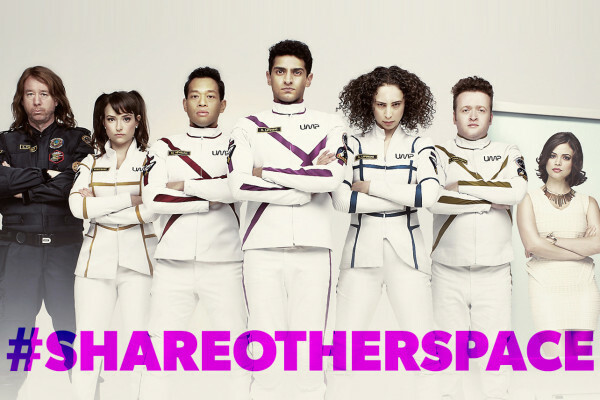 Make sure to use #ShareOtherSpace to get others on board. You may want to include Paul Feig's Twitter handle (@paulfeig) to let him know we're out there. Another way to help is to get onto Rotten Tomatoes (link below) and add a rating and maybe even a review. There's no doubt that "Other Space" deserves more attention. When I re-watched the series to help write this article, it became clear to me that I didn't just like it back in 2015, I adored it! It's a shame that two years have gone by since it was released, and not many people in my social circle have even heard of it. But the show is wonderful, and it's even better the second time around. I know that I'll be watching it again. And again. And again. 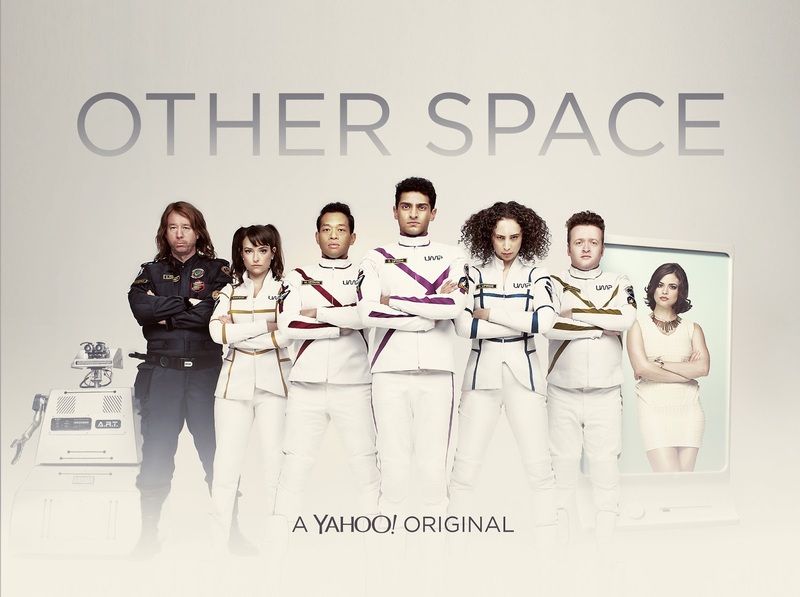 To watch the entire first season for free, visit: www.yahoo.com/tv/tagged/other-space. Most Smart TVs also have a Yahoo app which can play the series. TRIVIA: "Other Space" was originally created by Paul Feig around 2005 for NBC. This was one of Feig's only older ideas that he felt the need to bring back from the dead. Feig also insisted on having all 8 episodes released at the same time to take advantage of the binging trend.